Born on November 9, 1922, in Cleveland, Ohio, Dorothy Dandridge sang at Harlem’s famed Cotton Club and Apollo Theatre and became the first African-American woman to be nominated for an Academy Award for best actress. Her ability to break new ground for African American women in film has drawn comparisons between her and baseball great Jackie Robinson.In her childhood, Dandridge experienced some difficulties. She never knew her father. Her mother, actress Ruby Dandridge, left her father while she was pregnant with Dorothy. Dandridge later suffered at the hands of her mother’s girlfriend, Geneva Williams. Williams was the displinarian in the family and was known for being strict and cruel with Dandridge. Dandridge was pushed into show business at a young age by her mother. Dandridge performed with her sister Vivian for a time as a song-and-dance team billed as “The Wonder Children.” The girls performed throughout the South, playing black churches and other places. 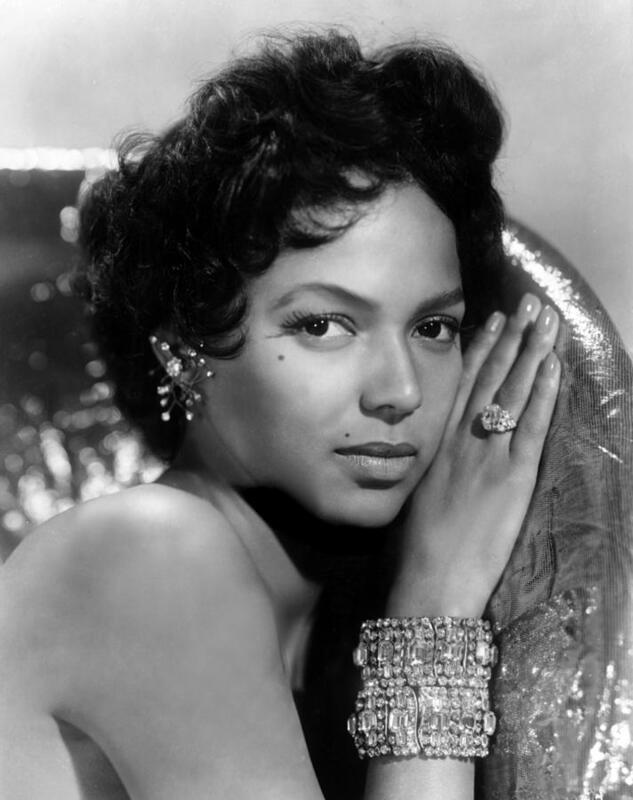 In the 1930s (one source says 1929), Dandridge moved to Los Angeles, California, with her family in search of stardom. She found some success with her musical trio, the Dandridge Sisters. The group included Dorothy, her sister Vivian and Etta Jones. They performed with the Jimmy Lunceford Orchestra and Cab Calloway. The duo even played gigs at the famous Cotton Club in Harlem. As an African American singer, Dandridge confronted early on the segregation and racism of the entertainment industry. She may have allowed on stage, but in some venues she couldn’t eat in the restaurant or use certain facilities because of the color of her skin.As a teenager, Dandridge began to appear in small roles in a number of films. She and her sister appeared in the Marx Brothers film A Day at the Races(1937). The Dandridge Sisters appeared in Going Places (1939) with Louis Armstrong. On her own, she danced with Harold Nicholas of the dancing Nicholas Brothers in the 1941 Sonja Henie musical Sun Valley Serenade. The duo’s tap dancing routine was cut from the version of the film shown in the South. She played an African princess in Drums of the Congo (1942). That same year, she married Harold Nicholas. But their union proved to be anything but a happy one. During their turbulent marriage, Dandridge virtually retired from performing. Nicholas reportedly liked to chase other women. But her greatest heartbreak came in 1943 with the birth of her first and only child. She was stuck home alone when she went into labor. Dandridge blamed her husband for their daughter’s severe brain damage. Dandridge paid for their daughter Harolyn to receive private care. After her divorce in 1951, Dandridge returned to the nightclub circuit, this time as a successful solo singer. After a stint at the Mocambo club in Hollywood with Desi Arnaz’s band and a sell-out 14-week engagement at La Vie en Rose, she became an international star, performing at glamorous venues in London, Rio de Janeiro, San Francisco, and New York. She won her first starring film role in 1953’s Bright Road, playing an earnest and dedicated young schoolteacher opposite Harry Belafonte.Her next role, as the eponymous lead in Carmen Jones (1954),a film adaptation of Bizet’s opera Carmen that also costarred Belafonte, catapulted her to the heights of stardom. With her sultry looks and flirtatious style, Dandridge became the first African-American to earn an Academy Award nomination for best actress. Though many believed she deserved to win, Dandridge eventually lost the award to Grace Kelly (The Country Girl). Still, after the phenomenal success of Carmen Jones, Dandridge seemed well on her way to becoming the first non-white actress to achieve the kind of superstardom that had accrued to contemporaries like Marilyn Monroe and Ava Gardner. In 1955, she was featured on the cover of Life magazine, and was treated like visiting royalty at that year’s Cannes Film Festival. In the years that followed her success with Carmen Jones, however, Dandridge had trouble finding film roles that suited her talents. She wanted strong leading roles, but she found her opportunities limited because of her race. According to The New York Times, Dandridge once said, “If I were Betty Grable, I could capture the world.” Her Carmen Jones co-star also addressed this issue, saying that Dandridge “was the right person in the right place at the wrong time,” according to the Boston Globe. Besides Carmen Jones, Dandridge’s only other great film was 1959’s Porgy and Bess, in which she played Bess opposite Sidney Poitier. She turned down the supporting role of Tuptim in The King and I because she refused to play a slave. It was rumored that she would play Billie Holliday in a film version of Lady Sings the Blues directed by Orson Welles, but it never panned out. In the racially disharmonious 1950s, Hollywood filmmakers could not seem to create a suitable role for the light-skinned Dandridge, and they soon reverted to subtly prejudiced visions of interracial romance. She appeared in several poorly received racially and sexually charged dramas, including Island in the Sun (1957), also starring Belafonte and Joan Fontaine; Tamango (1959), in which Dandridge plays the mistress of the captain of a slave ship; and Malaga (1960). While making Carmen Jones, Dandridge became involved in a heated, secretive affair with the film’s director, Otto Preminger, who also directed Porgy and Bess. Their interracial romance, as well as Dandridge’s relationships with other white lovers, was frowned upon, not in the least by other African-American members of the Hollywood filmmaking community. On the rebound, she married her second husband, Jack Denison, in 1959, which proved to be another troubled relationship. He was verbally abusive and mishandled her money. She lost much of her savings to bad investments, including Denison’s restaurant, which failed in 1962. He left her soon after.As her film career and marriage failed, Dandridge began drinking heavily and taking antidepressants. The threat of bankruptcy and nagging problems with the IRS forced her to resume her nightclub career, but she found only a fraction of her former success. Relegated to second-rate lounges and stage productions, Dandridge’s financial situation grew worse and worse. By 1963, she could no longer afford to pay for her daughter’s 24-hour medical care, and Harolyn was placed in a state institution. Dandridge soon suffered a nervous breakdown.